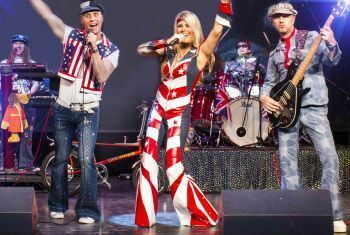 It’s time to dig out your platforms for a night of glam-rock, disco and party anthems as the Solid Gold 70s Show comes to St George’s Hall, on 17 April. Reviving the golden age of pop, it’s the latest hit-packed live concert show from the creators of the Magic of Motown. Featuring sparkling vocals and a super-cool band with musicians who have appeared alongside Mike Oldfield, Asia and Ultravox, this show guarantees customers the poptastic time of their lives. With hits such as We Are the Champions, Don’t Go Breaking My Heart, Mr Blue Sky, Grease, Waterloo, Devil Gate Drive, Daddy Cool and Xanadu from a host of much-loved artists including;Queen, Sweet, 10cc, Abba, David Cassidy, The Carpenters, Suzi Quatro, Boney M, Elton John, Bay City Rollers, David Essex, The Osmonds, T. Rex, ELO and many more.